Abraham totaled 23.5 sacks in college and was a first-team All-Southeastern Conference selection in 1999. He was chosen by the Jets in the first round of the 2000 NFL draft (13th overall) and was used effectively as a pass-rushing outside linebacker as a rookie, garnering 4.5 sacks in six games until a hernia injury that required surgery ended his season. With the Jets shifting to a 3-4 defense for 2001, Abraham was moved to right defensive end. Jets went 10-6 to finish third in the AFC East and qualify for the postseason as a Wild Card. Lost AFC Wild Card playoff to Oakland Raiders (38-24). With his great speed and ability to pursue plays, Abraham had another Pro Bowl season in 2002 with 10 sacks, although he was regularly double-teamed. A groin injury limited him to seven games in ’03, but he still recorded six sacks, and bounced back in 2004, despite missing four more games to injury, with 9.5 sacks and selection to the Pro Bowl for the third time. 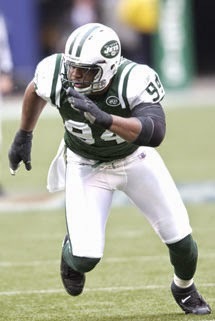 Following a 10.5-sack season in 2005, the Jets traded Abraham to the Atlanta Falcons. He endured another injury-plagued year before coming back to record 10 sacks in 2007 and a career-high 16.5 in ’08 while appearing in all 32 games. A relative down year in 2009 was followed by a 2010 season in which Abraham had 13 sacks and achieved consensus first-team All-NFL as well as Pro Bowl recognition. He played two more years with the Falcons, recording a franchise-high 68.5 sacks over seven years, and moved on to the Arizona Cardinals in 2013, where he played outside linebacker, recorded 11.5 sacks, and returned to the Pro Bowl. He was placed on injured reserve following the first game of the 2014 season due to a concussion. Overall, through 2013, he had appeared in 192 games and accumulated 133.5 sacks, ranking ninth all-time in NFL history. He has twice been a consensus first-team All-NFL selection, received at least some all-league recognition in one other season, and has been chosen to the Pro Bowl five times.